In the 2014 election cycle, Tom Steyer spent over $65 million of his own money on key Senate and gubernatorial campaigns. That is a lot of money, but that isn’t much compared to the money being put forth by the Koch brothers’ network. As climate activists and citizens of the human race, we want Tom Steyer and others to spend massive amounts of money to communicate climate issues to the public during election season (and all the other seasons, too). We, of course, want money out of politics. It is obvious that the money being spent on political campaigns isn’t really effective anyway. But, we do need to have some money put toward voices of reason during election cycles, mostly because we have a scientifically illiterate public. There are, however, other strategies that billionaires like Tom Steyer could utilize to get better results. Let’s be honest, investing in a political campaign is a waste of money. That is not to say that money spent on educating the public about climate change is a bad investment. But, you can’t buy votes. There are two types of people: party-line voters and independent voters. Party-line voters have already made up their minds, and independent voters generally make decisions based on their own research and are not influenced by political ads. So, let’s say you are a billionaire climate activist. How would you spend $100 million in a way that would influence the next few years of climate decisions in a big way? First of all, whom are the people making the most influential climate decisions? The president and Congress are making pretty big decisions, but we’ve already established that billionaires can’t influence the outcome of elections. Also, it is unrealistic to expect a small group of millionaires and billionaires to strategically fund a set of candidates and win while there is another group of millionaires and billionaires funding candidates on the other side. As Tom Steyer stated at a recent event, "If it is an arms race, we are in big trouble.” So, how can a billionaire climate activist change the game? Answer: Strategically fund the green schools movement. What’s so great and influential about the green schools movement? Well, a lot of things. One in 4 Americans go to school every day. And, those 25 percent of Americans are going to school to either teach or learn. This is truly amazing. Where else in society do we see so many people show up every day for such a clear and pure purpose? Schools are the centers of our communities. You probably pass at least one school on your way to work every day. Being the center of the community makes them perfect venues and avenues for public discourse. What happens when you put solar panels on schools? People talk, question, think and understand. 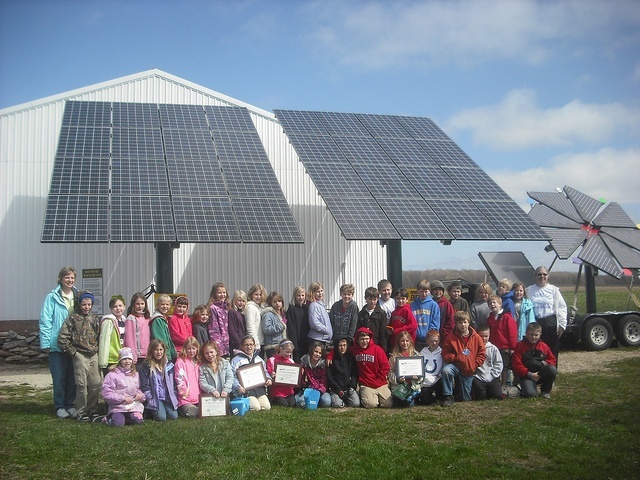 What happens when you build a net zero energy school? People talk, question, think and understand. Perhaps the most obvious reason for funding the green schools movement is to create the next generation of sustainability leaders. Of course we need scientists, engineers and designers to solve some very tough problems. But we also need leaders and everyday citizens that are fluent in the sustainability conversation. We need a scientifically literate public like a heart needs a beat. And the green schools movement is the vehicle that will push scientific literacy forward. In any case, if you are billionaire climate activist, we need you to leverage money and influence for more climate solution sets. We need solution sets that create unprecedented demand for sustainability. We need solution sets that create local community conversations about climate all over the country. We need solution sets that do more than keep climate deniers out of office. If you are a billionaire climate activist, you have the power to be more strategic and influential than any one person or climate organization in the country. If you are a billionaire climate activist, I hope you have a plan that includes the green schools movement. Any plan that doesn’t seems insufficient and incomplete. Joseph Plummer is a degree candidate in the Executive Master of Natural Resources (XMNR) program at Virginia Tech, expecting to graduate in May 2016. He currently works for a non-profit organization that works with schools and school districts on renewable energy and sustainability initiatives.